There's nothing like taking the wrapper off a fresh container of ice cream (I'd say half gallon, but no one wants to make those anymore). 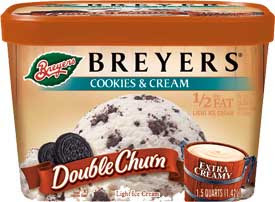 Anyway, last night I opened a fresh container of Breyer's Double Churn Cookies & Cream. You have to be careful with Breyer's because there are several variations: I had the regular old double churn which uses some skim milk to cut the fat in half but still leave you with a respectable taste (I believe they also call this the Light version). There is also the fat free version which uses no regular milk, just skim (comes in the Chocolate Cookies & Cream flavor and Chocolate Fudge Brownie). The third double churn style is No Sugar Added, which comes made with my arch enemy, the evil SPLENDA. I'm sorry, but I don't buy things with Splenda, end of story. on second scoop: hmmm, the cookies to ice cream ratio has not remained consistent ...ok, it's actually kind of embarrassing. I think I had better luck on the last container, but keep it in mind.